The Amazon River basin, including dark traces for each proposed source rivers: Napo, Marañón, Huallaga, Urubamba, Apurímac, and Mantaro. A full descent of the world’s largest river can be likened to a full ascent of the highest mountain, with various natural challenges along the way. The Amazon River is generally considered the mightiest river in the world because of its incredible volume (it carries over eight times as much water as the next largest river, the Congo), its maximal length (which may be slightly more than that of the Nile), and the importance of its basin for the world’s ecology. The entire Amazon River, including its source, has intrigued the public, geographers, and adventurers for centuries. The allure of descending the Amazon goes back at least to the time of Francisco de Orellana, whose 1540 expedition started on the Napo River. Since then, dozens of expeditions have sought to travel the entire length of the Amazon. For adventurers, the location of the river’s source is critical because it defines the route, including the most difficult part of the journey through the formidable whitewater of the Andes mountains. During most of the past century, the source of the Amazon River was considered to be the Apurimac River, based on the belief that it was the most distant upstream extension in the Amazon basin. Initial attempts to navigate the river starting in the 1950s ended in disasters with team members drowning in the difficult rapids. Although many other would-be Apurimac-Amazon adventurers failed in their attempts, several teams have successfully made the descent – starting with Piotr Chmielinski and companions in 1985-1986. However, our new research results published in Area demonstrate that the most distant source of the Amazon is not the Apurimac River as previously thought. Rather, it is the Mantaro River, a neighbouring stream that joins the Apurimac to form the Ene River. These new findings change the uppermost ~800 km of the Amazon source-to-sea journey, including all of the whitewater. This result drastically changes the journey down the Amazon. While gathering data for the article in Area, I realized that distance measurements based on topographic maps and satellite images were limited because these methods often have low resolution and sometimes do not show current river channels. Simply measuring distances on topographic maps and satellite images would not suffice, because these often have low resolution (and therefore errors) and sometimes do not show current river channels. The best way to obtain an accurate up-to-date measurement is via direct GPS tracking on a descent of the river. It is for this reason that I descended both the Mantaro and Apurimac Rivers from their sources – no easy task with the numerous class V rapids (the most severe whitewater classification) on each river. 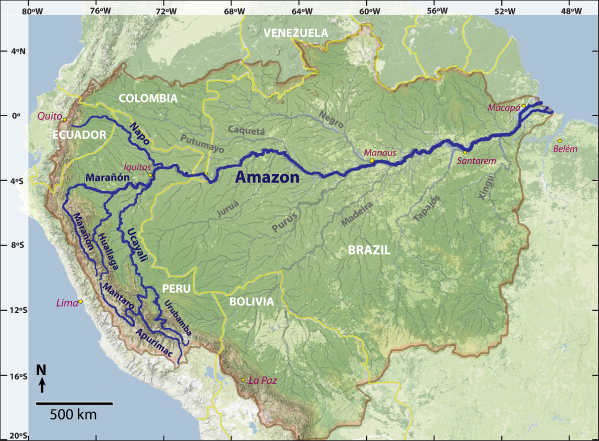 Since my initial scientific expedition in 2012, which also included a GPS-measurement of the entire Amazon to the Atlantic, at least two other expeditions have descended the Mantaro River down the Amazon to the sea, prompting attention from the paddling community and public. Had such attention been directed to the Mantaro River decades ago, it might have prevented its desecration with pollution and damming. About the Author: James Contos is director of the non-profit river conservation organization SierraRios and completed the Area study along with Nicolas Tripcevich, an archeologist at UC Berkeley who has expertise with GIS software and the ancient cultures of Peru. Schaffer G (2013) “Fastest to the Atlantic Wins”; Outside Magazine : January 2013: 38-39. Moag J. (2013) “True Source”; Canoe & Kayak. June 2013: 42-50, 86-88. 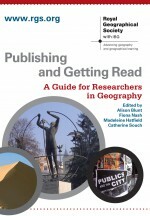 This entry was posted in Area and tagged Cartography, DEM, GIS, hydrography, HYDROSHEDs, Peru on April 3, 2014 by RGS-IBG Managing Editor: Academic Publications.